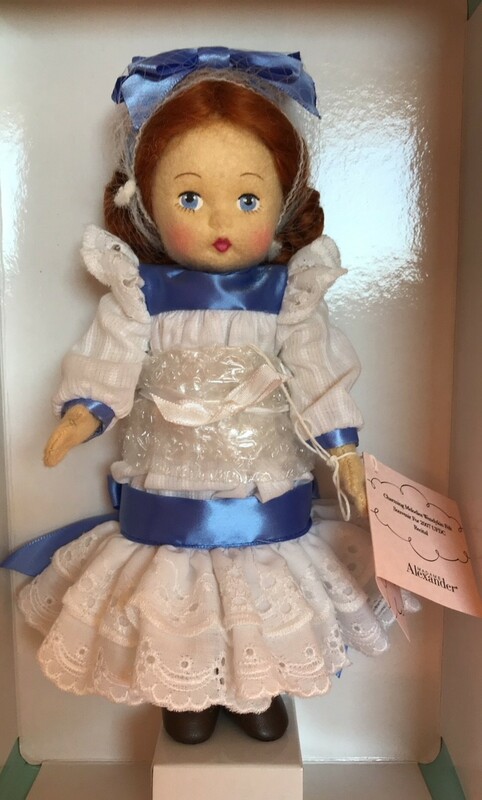 Highly collectible 9 inch felt doll with hand-painted face and high quality mohair wig. Her face is sculpted in the likeness of the iconic Wendy face. She's wearing a beautifully detailed Victorian dress with a dropped waist and skirt of multi-tiered eyelet. The dress is accented with blue satin ribbon matching Wendykin's hair ribbon. Her outfit also includes white tights; lace-trimmed pantaloons; white and black leather side button boots. She comes in a special commemorative Madame Alexander tin box. Never displayed - I did add bubble wrap under her tie to prevent wrinkling and pull her hairnet up to photograph her face.